Stepping in: Union coal minister Sriprakash Jaiswal will meet representatives of the workers’ union today to discuss their demands. Pankaj Nangia/Bloomberg. Kolkata: Production by Coal India Ltd has been hit hard by a recent strike by workers and excessive rainfall at some of its collieries, affecting coal supply at most thermal power stations across India. The officers’ association at Coal India has called another strike on 15 November to protest non-payment of performance linked-bonus. This is unlikely to affect production, as general workers, who constitute 85% of Coal India’s workforce, will not join the strike. 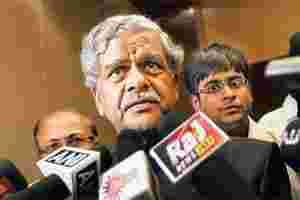 Union coal minister Sriprakash Jaiswal is to meet representatives of the workers’ union on Monday to discuss their demands. Coal India produces 1.5 mt coal a day during October, but it only managed to produce 250,000 tonnes on the day of the strike. Coal India’s share price on Friday dropped 2.9% to ₹ 322.30 at the Bombay Stock Exchange even as the exchange’s benchmark Sensex rose by 1.2%. It has lost 23.7% since June after the stock hit its lifetime high of ₹ 422.3. The Sensex has lost 7.8% during the period. Coal India is a constituent of the Sensex. The employees have been paid a major part of the bonus they were demanding, a Coal India official said. He did not want to be identified as he is not authorized to speak to the media. Coal India’s production in the July-September quarter dropped 5% to 80.31 mt over the corresponding period last year because of excessive rainfall in some collieries. The rainfall over the last few months in Northern Coalfields Ltd, one of the largest producers for the company, was the highest in the last 13 years. Even though rainfall eased in October, the supply situation remains tight as despatches are still taking place from last month’s production, the officer cited earlier in the story said. A Friday release from Coal India said it has stepped up supplies to power stations across the country. On Wednesday, it supplied 0.97 mt to power utilities against 0.64 mt a week back, the release said. Coal India will also supply 4 mt of additional coal in October to tide over the coal shortage by power utilities, the company said. Many power utilities have, however, been grappling with a large-scale coal shortage, running out of stock fast. So far, 15 rakes of coal were received by the West Bengal State Electricity Distribution Co. Ltd (WBSEDCL), which will be able to take care of the situation for two days, according to an official of the West Bengal’s power department. The districts and Kolkata have been experiencing blackouts. West Bengal power minister Manish Gupta said there was no shortfall, but the Coal India officer said “the crisis is not yet over". Apart from the supply-side constraint, there are also issues of pending payments to the miner affecting smooth supply of coal. The government owes ₹ 500 crore to Coal India and, according to the official, the miner stopped supply because of the dues. “We have already paid ₹ 70 crore and will be making a part payment of ₹ 60 crore soon," said Gupta. However, the finance minister is yet to release the fund and a government order is yet to be issued. The power tariff revision has been put on hold and concerted efforts of power minister Gupta and finance minister Amit Mitra failed to convince chief minister Mamata Banerjee to give her approval to increasing tariff.